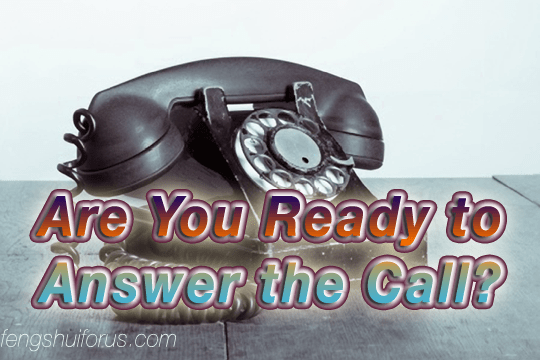 Home Feng Shui Consultant Training Are You Ready to Answer the Call? As this holiday season ends, how much did you GIVE? When you were searching for the perfect gifts for your loved ones, did you include yourself in the list? What, if anything, did you give yourself? How much happiness did you derive from those gifts? How about the next time you choose something that brings peace and well being, that acts on both nature and nurture. Perhaps something that might lead you to a new career: Something that removes you from the hectic daily grind that relegates your wishes, needs and dreams to the very last place? What about YOUR contributions to the world? The things that YOU came to do, regardless of who your partner is or the roles you may be playing — as a parent, a spouse, a daughter, a friend. Consider something spectacular. Feed your inner strength, dive into your passion, give a spin to your wheel of life areas, engage in a life changing experience. Are you ready to answer the call to become a Feng Shui Consultant? You’ve been thinking about it, you’ve been dreaming about it, but when will you take that first step? I invite you to experience the profound healing and transformation that comes with the Feng Shui Consultant Training – Earth Level (Feng Shui for Homes). Experience the joy of working with your first client. Discover your power as you learn the wisdom teachings of one of the most ancient healing modalities on the planet, the art of space arrangement that uses the symbols and signs in the environment to produce improvements in people’s lives. During the Feng Shui Consultant Training – Earth Level, you will master each of the Nine Steps to Feng Shui® as they apply to homes. The Nine Steps are based on principles of natural and universal law. Truly the soul trip of a lifetime. Are you dying to start your training, but don’t have the money? Purchases for courses on my site go through Paypal, and if you apply for Paypal credit, you can use it to purchase the training, and pay no interest for the first six months. If you split the cost of the course in six and make a payment per month, you won’t pay any interest. Another participant got a work contract that generated more money than she needed for the course she wanted to take. To sign up for this course, click here. When was the last time you gifted yourself a life-changing experience? This just might be your year! May 2016 Be the Year for Success, Joy, Love and Light!